test copy When you have no pancakes for breakfast. . . .
ELBERTON, GA - A veterinarian in George is nursing a rescue dog back to health one meal at a time. 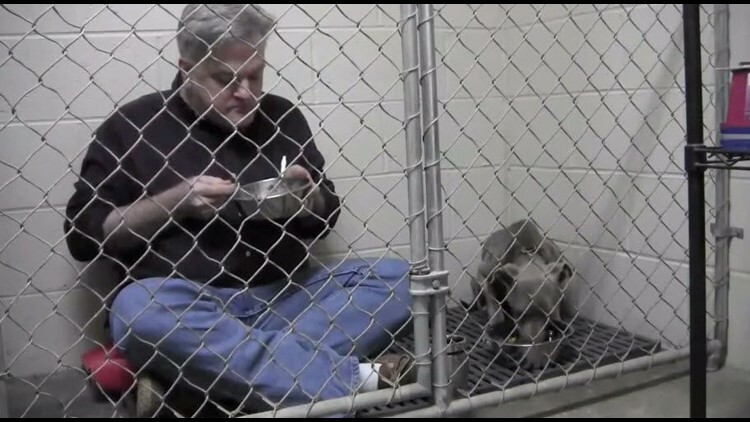 Dr. Andy Mathis with Granite Hills Animal Care in Elberton sits inside a cage to soothe Graycie who was scared and having trouble eating. He stays inside her cage to eat side-by-side with her. On the Granite Hills Animal Care Facebook page, Mathis explains someone called about finding a stray dog the night of Friday, January 29. The caller said the dog was in bad shape and was found on a dirt road. Mathis said to bring the dog in and the care center would evaluate her. Graycie was emaciated and dehydrated, weighing 20 pounds. She was also hypothermic, anemic, and had a vaginal prolapse. Graycie was first treated at the University of Georgia and after that she was returned to the Granite Hills Animal Care facility and slowly began to improve. According to the Granite Hills Animal Care Facebook page, Graycie started eating on her own, gaining weight, tests showed that her blood levels were slowly improving and the prolapse problem was fixed. To continue to encourage Graycie to eat, Mathis decided to sit in her cage with her so they could eat side-by-side. Mathis also reported that Graycie is spending her days curled up on towels under heat lamps, waiting for her next meal or barking at the other cats and dogs. Before Graycie is ready for her forever home, she has to learn to trust people, walk on a leash, go to the bathroom outside, and receive a clean bill of health. Mathis also gives credit to his entire team, affectionately called #‎TeamGraycie, for aiding in her recovery and thanks the public for the outpouring of positive thoughts and donations. Graycie, also known as Graycie Claire, was given her name because of her gray coloring and the addition of the second name is in keeping with Southern tradition.